I don’t think W is a fan of my singing. I’ve mentioned before how much I like to sing. (20 Songs to Sing with Your Baby). And, despite my terrible voice, W has always enjoyed living his life as if it were a musical. It started innocently enough. With one thumb in his mouth, W would slowly bring his other hand up to cover mine. At first I didn’t think anything of it. But now it’s happening all the time! He’s actually covering my mouth! I’ll admit I felt somewhat deflated… for just a moment. Then, I pushed his hand out of the way and burst into Taylor Swift’s Shake it Off. There’s no way I’m letting any baby stop my singing. In fact, here’s a list of Fun Halloween Songs for Kids that I’ll be singing for the rest of October- whether W likes it or not. 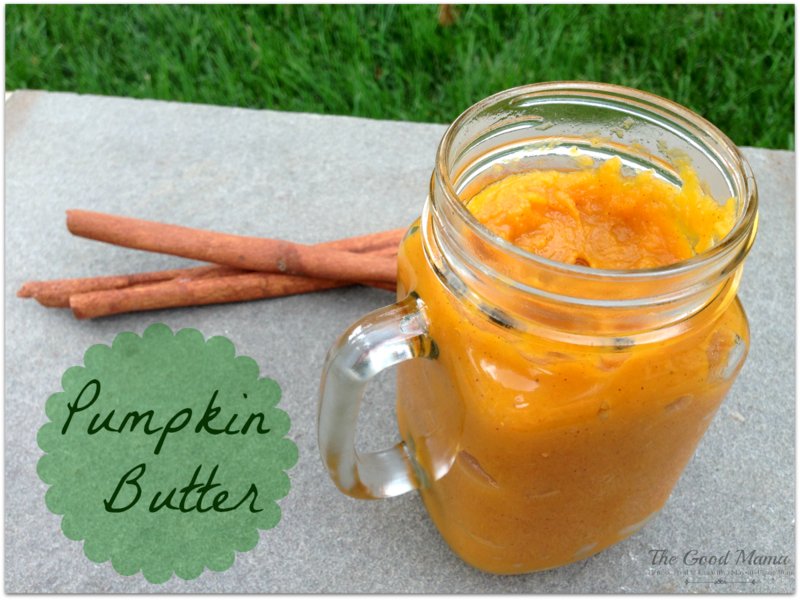 Check out the rest of the Fun for Kids on The Good Mama blog. Ooooooh went the wind, and out (clap) went the light! There was an old woman all skin and bones. OooOOoooOOh! She lived down by the old graveyard. OooOOoooOOh! One night she thought she’d take a walk. OooOOoooOOh! She walked down by the old graveyard. OooOOoooOOh! She saw the bones all laying around. OooOOoooOOh! She went to the closet to fetch her broom. OooOOoooOOh! She opened the door and…. BOO! Pumpkins, pumpkins on the ground. Pumpkins, pumpkins carved at night. As jack-o-laterns they give a good scare! Five little witches flying in the air. Five little witches give a good scare! Five little witches stir their brew. Five little witches come after YOU! Here’s an adorable video version of The Five Little Pumpkins! 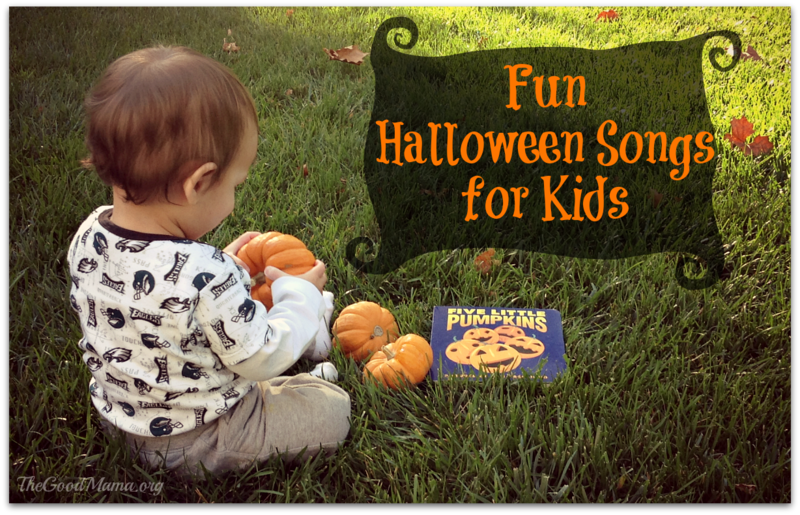 What’s your favorite Halloween Song to Sing with your kid(s)? Let me know in the comment section! Haha just wait until he becomes a teenager and you dance and sing in the kitchen one day. It can be the ultimate revenge when he gets older. Dawn- Oh, I can’t wait! Too funny! Thanks for stopping by. Great idea – I needed the words for Monster Mash too! Love your site background, so pretty! Kristen- Thanks! haha, I’m actually thinking about changing the background of my site. I may have to keep it now. Robin- I bet that’s so cute when they are all singing! Thanks for your comment. I sing to my kids too — and they tell me to stop. I sing anyway. Do you do the Thriller Dance? My kids were entranced (and stopped telling me to stop singing). Nancy- I can’t believe that I haven’t done the thriller dance for my son yet. Now, that’s something he would like! Thanks for your comment. Stacey- I totally agree with you. It’s just the best! I know… he’s only 14 months too. Thanks for you comment. CourtneyLynne- Hope your daughter likes them! Thanks for the comment! Jane loves 5 little pumpkins, and she’s been watching the video for a couple weeks. So cute! Sorry about W’s change of heart… Perhaps Adam has been brainwashing him? Oh, and nice knits in the top pic!! Melissa- You’ll have to borrow our 5 Little Pumpkin book. It’s W’s favorite right now. Thank you! I love our knits too! Love the songs! My boys are 18 and 22 and cringe at my singing but I don’t care I just belt it out anyway! In their defense I can’t sing worth a hoot! Michelle- haha, I think all kids must cringe a little at the things their parents do. Just wait until they are the ones singing and dancing for their kids! Weird. I noticed Dad has been covering my mouth too, ever since W slept over! I think there must have been some guy talk going on haha. You know I have sung my way through my life (and yours) with no regrets (or talent). There seems to be a song that fits every situation…and if there isn’t, they are easily made up on the spot! Here’s to singing! Mary Kay- haha They must have talked! I always liked your singing- still do. I know where I get it from! Cute songs! My kids will love them. I’m going to show them the 5 little pumpkins youtube video. Melissa- Yes, the video is so cute! We have the book too which my son loves. I definitely recommend it! Ha! My kids hate my singing AND dancing! I don’t ever remember trying to shut MY mom up. When did kids get so pushy??? JenEverAfter- I’m glad I’m not the only one! haha My mom still sings all the time. Hm.. I wonder where I get it from? Thank you for providing the lyrics. We can use this as an easy reference! Theresa- Your welcome! I hope you enjoy singing with your little ones. oh my thats cute he does that 🙂 I get bored reading the same book over and over so I’ll start reading in a British accent and my kids hate it. Not quite the same thing 🙂 I like the songs you shared…..we’ll have to try them . thanks! Maggie May- haha, I like to do different voices too! My son likes it… for now. We’ll see how he likes it as he gets older. Cute playlist! Thriller will always be a favorite! Jessica- Yes, it is just so much fun! That is kinda funny.. we just cover our ears when we do not like each other singing.. which is all the time. Kungphoo- haha! I guess you can all sing to yourselves. Terri- Aw, kids are so honest, aren’t they? Mrs. Mashed Up- I like your attitude! Sing away! Adorable! I only know two of those songs on the list but I bet my daughter will love them. Halloween is sure to be a big hit this year. My daughter loves singing….but she rarely wants me to sing with her. Haha, unless it’s a fun new song she’s never heard. I had forgotten about some of those Halloween songs from my childhood. Thanks for the list! Bree- I hope your daughter likes these songs and lets you sing to her. Thanks for stopping bY! W is a little rascal! Keep up the singing. I love these songs, and will be accosting my own children with them too. Thanks for the songs and the post! Deborah- He is, isn’t he? haha I hope your children enjoy these songs! Thanks for stopping by! Love it, we don’t celebrate Halloween but it’s good to see how others do. Shaney- You could totally modify these songs so they aren’t Halloween songs. 5 Little Pumpkins could be Owls (like a commenter mentioned) or something else. Thank you for stopping by! These are great. My kids love to dance around to music and my daughter likes to sing along. Thanks for sharing. Jen- That’s great! I hope they like the songs. Thanks for your comment. These bring back happy memories for me! I loved them when I was little and my kids did too! Liz- I’m glad you like the songs. Thanks for stopping by! I sing all the time. My daughter loves it and makes requests. My son….well, he’s getting used to it. He’s covered my mouth a time or two. I’ll be singing the little pumpkins song tomorrow-my daughter loves that tune-she knows the song but with bubbles. It’ll be fun to sing it with pumpkins and see what she thinks. Tarynn- That’s so cute that your daughter makes request. It’s funny how different siblings can be! I hope she likes the song! Rosey- I’m glad to hear it! Thanks for stopping by! Thank you for providing a few new Halloween songs for us. My girls love for me to sing only when they are sick. Natasha- Aw, I hope your girls will let you sing these songs while they are feeling better this time. Thanks for your comment. Mrs. Jilly FisherJ- I hope they like them! Thanks for stopping by! Danielle- There are so many commenters with the same problem. I’m glad I’m not the only one! haha. Thanks for your comment. my daughter covers her ears every time i sing, ha! nicole recently posted…Gia I like this wine! Nicole- Aw! I’m guessing most kids do this! Thanks for your comment. How fun is this post?! I love that you focused on kid-friendly songs! We have a post coming up with Halloween Songs… but I really like your focus! Dawn- Thank you. I looking forward to reading about your Halloween songs. LOL! I feel you. Before having kids, I used to practice everyday on my Karaoke and sing at the top of my lungs. I even go on competition. But now that I have kids, every time I am about to sing, they stop me. They tell me I am not allowed to sing, but just them. They’re hilarious though. Anyway, these are some cute and fun songs for kids to sing. And the adults, too. Adin- If you went to competition for karaoke, I can guarantee you are much better than me! haha. Keep singing away! Thanks for stopping by! We don’t celebrate Halloween in Finland, or in Ecuador. So I don’t really know any Halloween songs. But these do sound like fun! Joanna- There was a previous poster that turned the 5 Little Pumpkins into 5 Little Owls. You could totally change it up to something that isn’t so “Halloweenish.” Thanks for stopping by! We had fun with “5 little owls”. Great collection – thank you! Laura recently posted…A is for Alligator. Feelings. Laura- Aw, I like your modification. You really could do a lot with those songs. Thanks for your comment. OH, that’s a lovely halloween song. Awesome one lady! Elizabeth- Thank you for stopping by and your comment! I love the adams family. Halloween is so much fun. Katrina- It is a lot of fun! I’m glad my son is now at an age where he is enjoying himself. Thanks for stopping by! It’s fun to sing whether you are a good singer or not! There are some great songs on this list. I’ve learned a couple new ones, as well! I’m a singer/songwriter – I LOVE this!!!!!! Sue- I did NOT know that! I would love to hear some of your songs. Do you have them on your blog? This is my daughter’s first Halloween and I didn’t even think of playing Halloween music. And I think she’ll love the video. Thanks! Paddington- Aw, that’s exciting! I don’t think I was thinking of Halloween music last year for my son’s first Halloween. I was TOO tired! Thank you for your comment. I hope your daughter enjoys it. I don’t think I have a Halloween song I sing with the kids, but we do say the “trick or treat.. smell my feet… etc.” poem a lot. My 6 year old son never gets sick of that one! 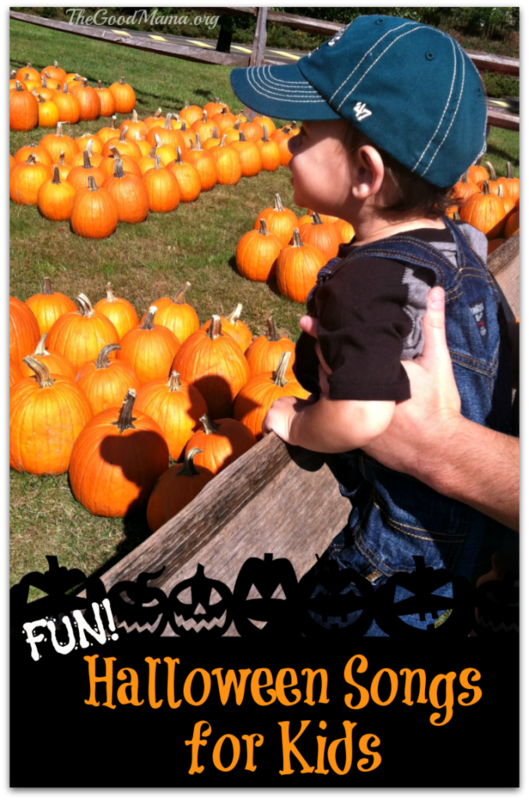 Lauren recently posted…Family Favorites: Books we Love in October featuring I See Me! Lauren- How could I forget that one? The kids always loved that one at school when I taught. Thanks for your comment. I like the little pumpkins song, and it will help with counting! Thanks for reminding me of these great songs! Nicci- The pumpkin song is great for counting. I used it when I taught Kindergarten. Thank you for stopping by!